The Eucharistic Miracle of Lanciano where bread and wine turned to living human flesh and blood in the hands of a doubting priest in the 8th century. 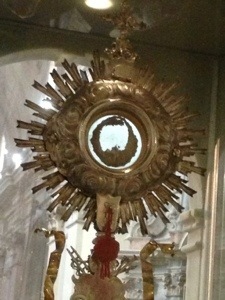 Then to Manoppello to see the face of God as miraculously imposed on the face cloth of Jesus, discovered by Sts. Peter and John on theorizing of Jesus’ resurrection. Lots on this miracles, unexplained cloth – as mysterious as the Shroud of Turin. Then dinner at a favorite restaurant great food and great wine – and with Liz Lev and her rousing presentation about Catholicism and how art and beauty drew her to the Catholic Church. One half flew home and one half (90 people) flew on the begin our Rome extension. 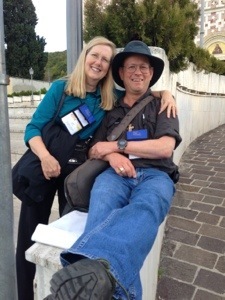 See our first day in Rome HERE.